After spending years rehabilitating a parcel of land, a group of women in Burkina Faso wanted to solidify their access by securing formal rights to the land they had worked. In much of the country, this process is full of barriers. But in some regions, this is changing, and providing a secure foundation for diversified incomes and livelihoods. The group of nearly 100 women farmers will soon receive their land rights for a two-hectare garden in a village in the north-central region of Burkina Faso. Applying for a Rural Land Tenure Deed, known by its French abbreviation as an APFR, will secure their rights to the land they have labored to bring back to life. Before the Nakomgo village women’s group started farming the land, it was infertile and fallow. A community member gifted the land in a traditional practice that allows the beneficiaries to use the land without ownership rights. The women’s group adopted soil regeneration techniques known as bio-reclamation of degraded lands (BDL). Working to build resilience in the region, the U.S. Agency for International Development-funded REGIS-ER project trained the women in bio-reclamation techniques for erosion control, water retention, to improve soil fertility and cultivate drought-resistant crops like sesame, okra and sorrel. “The soil was poor. 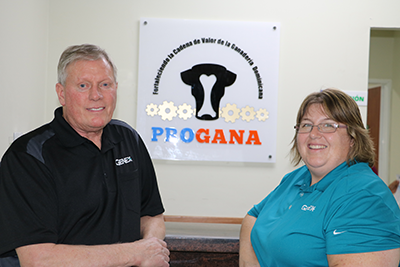 The project helped us make it productive, and then helped us negotiate ownership. We worked hard on this land and want to make sure no one can take it back from us now that we have made it productive again,” the group said. Access to land for women is complex in Burkina Faso. Social and economic constraints limit their access, the legal land tenure system is arcane, and customary rights favor men. Often, sites for bio-reclamation are gifted, and women working these fields are at risk of losing the fruit of their labor once the land is fertile again. 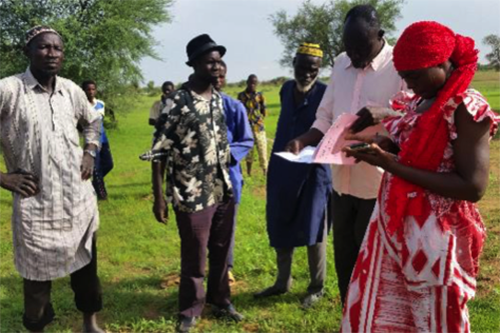 Partnering with the National Observatory for Land Tenure in Burkina Faso (ONF-BF), the USAD|REGIS-ER project, which NCBA CLUSA implements in both Burkina Faso and Niger, has sought to secure land rights for women’s groups by obtaining formal documents like APFRs. With formal tenure, women are guaranteed the benefits from the lands they have restored and farm. They can also use the land as collateral to access loans to diversify their economic activities. formal transfer of ownership. A key step in the process, the government surveyed the land, and they are now in the process of receiving their APFR land tenure certificate. The project and partners trained commune government services, such as the rural land service and local land commissions in deed-granting laws. The training specifically developed technical skills to implement a rural land tenure system. USAID|REGIS-ER trained more than 225 civil servants, elected leaders and religious leaders in the tenure law, and 216 local land commissions have been established and are ready to facilitate the obtention of land tenure certificates. Barsalogho rural commune, where Nakomgo is located, now has 75 local land commissions and a trained government surveying agent to facilitate the application process. Outside the project implementation region, over 80 percent of communes in Burkina Faso do not have these services. In the Barsalogho, 22 bio-reclamation sites have been surveyed and recorded, covering over 25 hectares of new land ownership for women’s groups. “We are ready to take up the challenge of securing land transparently and without conflict,” said Adboulaye Pafadnam, mayor of Barsalogho Commune. USAID|REGIS-ER and the National Observatory also trained commune teams to use a mobile digital mapping tool known as MAST (Mobile Application to Secure Tenure). Using a participatory approach, MAST enables land tenure services to collect and manage data about land resources, which is essential to guaranteeing rights. Fatimata Ouédraogo, a land tenure civil servant in the Sahel region, appreciates the practical benefits of MAST. She can collect spatial, multimedia data about farm land and other natural resources—directly, quickly and on site. She can now survey up to 50 parcels in two weeks on her own. To date, agents like Ouédraogo have been able to survey 64 bio-reclamation sites (over 70 hectares), offering land tenure to more than 3,000 women in the the rural communes of Barsalogho, Bouroom and Sevtenga in Burkina Faso. Beyond these bio-reclamation sites, these agents have also surveyed land for use as commons, such as community woodlands and livestock corridors. The survey data has supported the local conventions for natural resource management, another building block of resilience in the region. 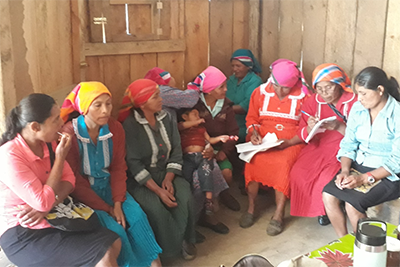 With the governance capacity, survey tools and newly reclaimed lands, women’s groups like the one in Nakomgo are building resilient, sustainable futures for their families and communities, founded on secure land rights. “Securing tenure for our site gives us the confidence to grow our crops peacefully, and to focus our energy on the organization, management and diversification of our crops,” said Bamogo Zambedé, president of the Nakamgo garden group.